Gordon Luckhurst, Senior Partner and Geoff Smith, Senior Litigation Officer, didn't show-up for two pre-arranged meetings allowing partner Margaret Dunton (according to a court document had left the firm two years previous) that I was complaining about to listen, at both times, to my complaints on her own, make the decisions which he (Gordon Luckhurst) agreed with, (ridiculous) which included several times my file had already been passed to him because of my complaints so now six years into the disastrous way my Litigation was/had being/been handled by Thomas Boyd Whyte (overseen by Gordon Luckhurst) which including they had had two case numbers at Court that they were randomly using that the Court Clerk after 15 months had to write to inform them of their error, I decided I would not pay any more money until he had complied with rule 15. 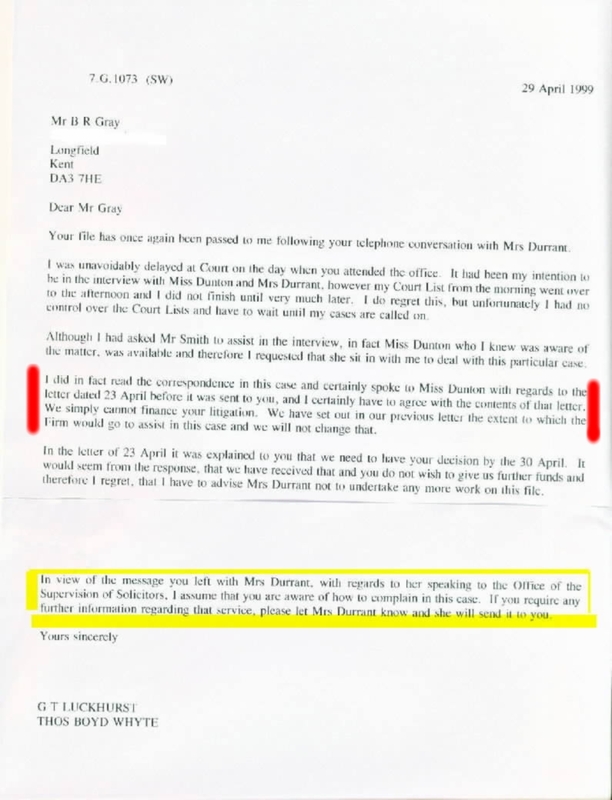 As can be seen below (outlined in yellow) at the third attempt to see Gordon Luckhurst he sarcastically told me to go ahead and complain to the Office of the Supervision of Solicitors which on the OSS advise I did, I was sacked a year later (7 June 2000) by Gordon Luckhurst for making an official complaint. "A solicitor who fails to honour an undertaking is prima facie guilty of professional misconduct. Consequently, the Office for the Supervision of Solicitors will expect its implementation as a matter of conduct". "fair criticism" is "entirely valid" and that the need for clients to be able to give feedback is "extremely important".